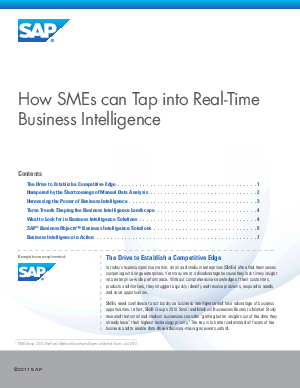 SMEs need confidence to act boldly on business intelligence and take advantage of business opportunities. In fact, SMB Group's 2012 Small and Medium Businesses Routes to Market Study revealed that small and medium businesses consider "getting better insights out of the data they already have" their highest technology priority. The key is to better understand all facets of all the business and to enable data-driven decision making as events unfold.